Hopes of reaching the postseason is slowly coming back into focus for the Hays Rebels. By virtue of a dominant 43-0 victory over the Leander Lions Friday at Bob Shelton Stadium, Hays (3-5, 2-2 in 25-6A) is now one game behind Vista Ridge in the battle for the fourth and final playoff spot. It now sets up a showdown between Hays and Vista Ridge, who square off in a critical battle for playoff positioning next week. Hays’ win over Leander was predicated on the success of its defense, which smothered Leander’s offense to the tune of 269 total yards in the game and forced five total turnovers. Junior linebacker Michael Mireles, who finished with an interception and a fumble recovery, said the shutout was a confidence booster across the board for the entire team. Early defensive success turned into gains for Hays’ offense, which operated its first three drives of the game inside of Leander territory. Hays capitalized on its field position advantage and quickly took a 22-0 lead early in the second frame. The Rebels added an additional 14 points before halftime, highliged by a 24-yard touchdown pass from junior quarterback Xavier Martinez to junior running back Thai Mayberry. Spearheading the Rebel offense was its rushing attack led by Mayberry, who rushed for 89 yards in the contest. Rebel junior quarterback Xavier Martinez finished the game with 42 yards and two touchdowns, while Cade Powell tallied 52 yards and a score. LaHue credited the play of the offensive line, which he said has been playing well all season long. Senior offensive lineman Jaydan Smith said the unit was more physical than the Lions, who struggled to corral Hays’ rushers. “They’re opening up holes. They (the offensive line) have done what they’ve always have, which they’ve done since day one,” Mayberry said. Special teams secured Hays’ final points of the game when Hays’ Darian Moore scooped up a blocked field goal attempt and returned it 50-plus yards for a touchdown. Leanders’ lone scoring threat came in the third quarter, but was thwarted when Mireles stripped the ball out of a ball carrier’s hands. 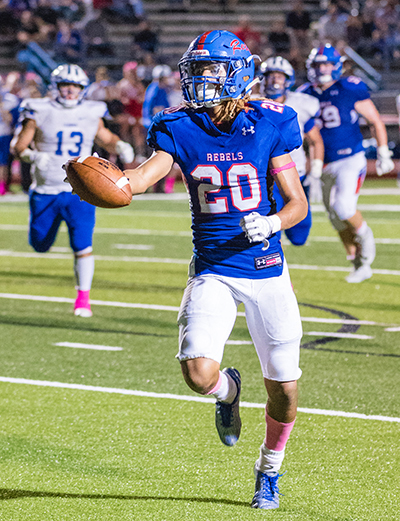 LaHue said the Rebels were able to contain Leander’s dual threat quarterback Rashad Carter, who finished with 108 total yards in the game. “He is an explosive player and I thought we did a great job of containing him,” LaHue said. Hays centers its attention on Vista Ridge, who may be the biggest threat to the program’s bid for the playoffs. Mayberry said the team is attempting to make up for last season’s loss to Vista Ridge, which essentially knocked Hays out of playoff contention.